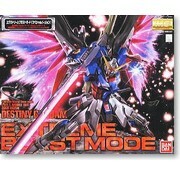 ZGMF-X42S Destiny Gundam Extreme Blast Mode (MG) plastic model kit by Bandai Hobby. - Includes a number of elements to recreate the Extreme Blast effect from the big screen! - Effect materials manufactured from PET, giving them a unique shimmer. - Joints feature heavy plating. 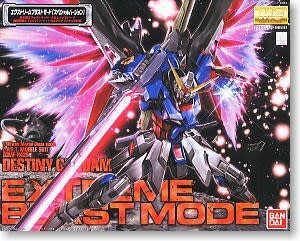 - Includes 1/20 scale pilot figure!